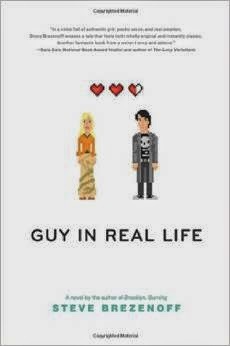 Guy in Real Life by Steve Brezenoff is a charming book. And if you think “charming” sounds too effeminate a for a book by a guy, about a guy (in part), in a review by a guy, and thus forms a lesser compliment because of that supposed feminine connotation, then you need to read this book more than you know. Lesh Tungsten (+1 for using a literally heavy metal for a character name) hides behind his dark hair and his darker music. He plays his role well. At least until he and Svetlana Allegheny meet cute, if you consider drunk and damaged to constitute “cute.” Opposites attract, or in this case, crash into each other. Svetlana is the light to Lesh’s dark, the eloquently aesthetic female to his mute brooding adolescent male. Svetlana crashing into Lesh’s life also leads to Lesh being grounded, which leads to his best friend Greg’s renewed attempt to convince Lesh to join him in a popular MMO (massively multiplayer online game, for the unitiated—think World of Warcraft). Lesh succumbs, but instead of spending his time leveling up the brutal warrior orc character he makes with Greg, Lesh succumbs to other urges and creates a beautiful, holy elf character named…Svvetlana. Adding to Lesh’s confusion, he finds himself drawn to this alternate online female identity, as Svvetlana joins a guild with a male character clearly smitten with her. In real life, Lesh and Svetlana begin eating lunch together in the school cafeteria, and what begins as Lesh helping Svetlana reject the unwanted attention of another male student drifts and then dives into mutual attraction between the heavy metal boy and the artistic, literary, role-playing game master. Yes, role-playing game master. (Sensing a theme here?) And when Svetlana’s Gaming Club needs another member to meet the minimum requirement for an official school club, you can imagine who she asks to join. Brezenoff alternates chapter narration among Lesh, Svetlana, and (most interestingly) Lesh’s online identities, Svvetlana the elf and Kugnar the orc warrior. We also delve deeply into the narrative of Svetlana’s role-playing game. The varying narrators help Brezenoff avoid the worst of the manic pixie dream girl stereotype. While Svetlana certainly does help move Lesh from darkness to light, Lesh’s experiences online as Svvetlana do so even more. I found those sections the most interesting, as Lesh deals with the tension of pretending to be a girl, and the growing realization that parts of this identity are preferable to the real, “male” role he inhabits in real life. Speaking of real life, I appreciated how, although the Svvetlana online secret identity led predictably to real-world complications, they were not the complications I anticipated. Sweetness and intelligence (“…and he does poke the last speck with one tine and he does eat it, abandoning Zeno like every decent philosopher since Zeno”-- + infinity for Zeno’s paradox reference) course through this vibrant young adult novel. This combination will undoubtedly garner comparison to John Green, but Brezenoff establishes his own voice(s) here, and in these times when our definition of masculinity has been “bro”jacked and diminished, I hope the larger questions Brezenoff asks about gender and identity are brought to as many readers as possible. Excellent review. I loved this book, and like you, enjoyed the tongue-in-cheekiness of Lesh's name, but was glad to find his dad ended up being a contractor, and not a TIG welder. This sounds like one to pick up. Also, I need to find a way to use "bro"jacked in conversation this week. Thanks to both of you for reading. And, sadly, I don't think you'll have any shortage of opportunities to slide "bro"jacked into conversation.